The projects, concepts, and thoughts of a qualified fungineer. 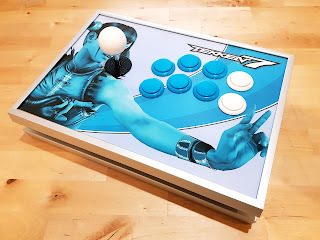 One of my earliest commissions is this Tekken-themed stick. The customer had a tight budget, but for the same price as the sub-par Venom stick he ended up with a full suite of Sanwa hardware, double-sided art, and a very solid little PC/PS3/PS4 (legacy) stick!